I started up Shetland Lace Shawls when I took early retirement from my mundane job. Just felt like the right thing to do and I’ve never regretted it - I’m doing something I love, am passionate about and you can’t get much better than that! My granny (photo below) taught me to knit before I went to school and I loved it - still do! In fact, I still knit my large square shawls in the traditional way, just as she showed me, by first knitting four borders, then attaching them to a centre square. 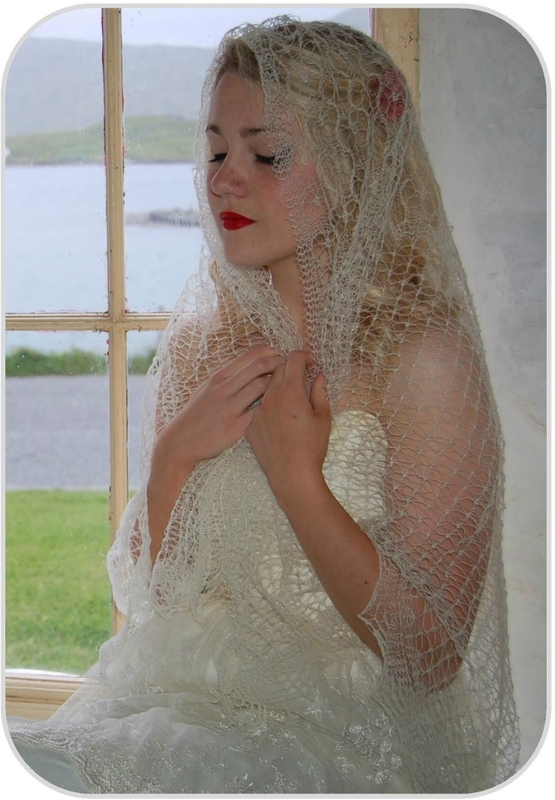 Many shawls nowadays are knitted from the centre outwards, but this does not produce the ‘riggies’ (garter stitch), which are a feature of a traditional Shetland shawl. I do not usually follow a written pattern and although I do use the traditional Shetland lace patterns, I also like to write my own, then mix and match to produce individual pieces. Because of this, none of my square 1-ply Shetland lace wedding or christening shawls will be exactly the same, so you can be sure you’re getting something unique. These bespoke shawls, if looked after properly, will last several generations and become a family heirloom, passed down from mother to daughter. Once the shawl is finished, it is dressed on a wooden stretcher (see picture above) specially made for the purpose. When knitting lace I use slightly bigger needles than is usual, which produces a much lacier look, almost ethereal in some cases. Despite its lightness and openness, Shetland Lace is surprisingly warm, perfectly complimenting both formal and informal wear, when you’d rather not wear a jacket. I tend to use genuine Shetland wool, but would be happy to use any type of yarn you want, eg cashmere, cotton, alpaca, etc, and if you have an idea for something in particular you’d like, I will do my best to knit it for you. This is a jacket (left) I knitted for a friend to go with her wedding outfit.